Inheriting from the Vapor Storm Puma Kit, the Puma Baby has more compact size and unique graffiti design. Working with single 18650 battery and 2ml/6ml Hawk Tank with advanced mesh coil, the Vapor Storm Puma Baby can bring you great vaping flavor. 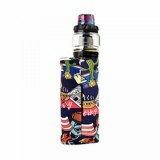 Vapor Storm Puma Baby, the upgraded vaping device of the Vapor Storm Puma, is still made of the light weight ABS material for good hand feeling. Decorated with unique graffiti series design, the Puma Baby Kit brings you more fashion and passion. It mainly consists of the Puma Baby MOD and the Hawk Tank. Powered by single 18650 battery, the Puma Baby can fire up to the output of 80W with advanced TC mode. And the Puma Baby also has 0.91 inch OLED display, which can bring you detailed working information. While the Vapor Storm Hawk Tank has 2ml e-liquid capacity with an extra 6ml large bubble tube, so you can have more vaping choice. Equipped with the 0.2ohm mesh coil, the Vapor Storm Hawk Tank can produce much better vaping flavor. 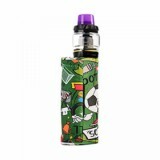 • You can buy Vapor Storm Puma Baby MOD and SMOK TFV8 Baby Coil in BuyBest.